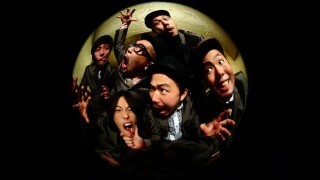 DALLAX began in Tokyo in 1998, created by Numb the singer, EP the saxophonist, and Tokkun the drummer. They were then joined by the guitarist Kosuke, by GEN on the trombone and by Athack, the funky bass player. They made their debut in the surroundings of Machida before releasing their first single in 2001, which was a big success. They participated in numerous omnibus albums between 2001 to 2002 and, at the same time, they released their maxi own single FEEL YOUR REALITY under the label DONA DONA Recordings. The band only continued to grow and evolve from there; slowly at times but never stopping! In May 2005, they finally released a full album, TOO BAD TO BE TRUE. They were found then by a German label, Pork Pie, to whom they signed and released a ‘best-of’ album during the summer of 2006, celebrating their first tour in Europe. Back in Japan, they released their second album, Core Color, in October and which will also be distributed in Europe from April of 2007. Inside, listeners can find Honesty which is a dynamic cover of the Billy Joel’s tune of 1978. To promote this album oversears, they will return to Europe for another tour lasting three weeks.